The decision of Patna based businessman, Ashok Chaudhary’s of visiting Ranthambore National Park in the blazing summertime seemed to have paid off well. He was lucky to have spotted an entire tiger family in Zone 9 of the national park because of which he is extremely happy. 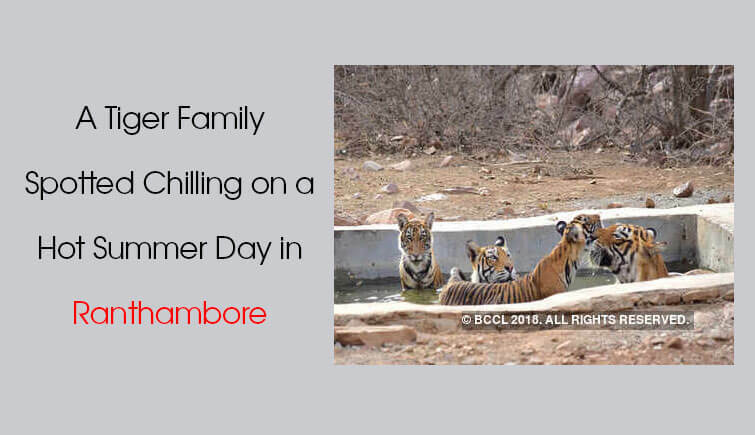 Yes, spotting an entire family is a rare experience but Ashok who was enjoying his safari in Ranthambore on Saturday, June 2, 2018, was able to sight tiger T-62 with his partner T-59 and their two 10 months old cubs relaxing in a pool of water. According to Ashok, this is the first time that this tiger family has been spotted together by a tourist. Supporting the claim, a forest ranger of Phalodi Range stated, these tigers have either been spotted individually or in a pair but never with their cubs, which was quite delightful to witness this time. T-62 is the son of T-34, Kumbha and brother of T-43, Surzan. He fled to Bundi Forest in 2013 due to the threat from his brother and father and another dominating tiger in the area, T-42, Fateh. However, he returned in 2016 and claimed his territory from Fateh who fled from the region.